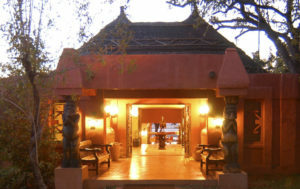 Chilwero means “place of high view” in the Setswana language, and the Lodge is suitably named as it sits on a hill above the Chobe River, and offers exceptional views of the River, and floodplains. Accommodation is in 15 spacious Thatched Cottages. 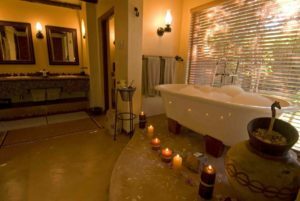 The cottages are all air-conditioned, have boast luxurious bathrooms, with free-standing bath, indoor and outdoor showers. In addition, there is a lounge area, and terrace, complete with hammock, overlooking the River. Each cottage also has a secluded garden. 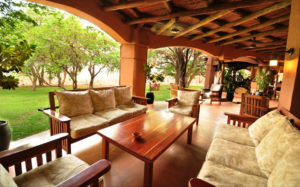 The main lodge area includes a lounge and dining room, which are linked to outdoor viewing patios. The wine cellar is temperature controlled and houses a large variety of the finest South African and European wines. You can also enjoy the use of a library, and communications centre. Meals are gourmet affairs, and dinners tend to be a delicious fusion of African and western dishes and delicacies, accompanied by an excellent selection of wines. High teas are often enjoyed on the lawn, under shady trees. Activities are varied, and you can enjoy game drives in Chobe National Park, which allows for exploring this diverse area, and seeing some of the elephants for which the Park is famous. You may also see buffalo, the endemic Chobe bushbuck, puku antelope, giraffe and lion. Game viewing (not to mention birding) is also excellent from the River itself – you can explore the Park from the River, on a sunset cruise. Fishing excursions are also available at an additional cost (pre-booking is advised). You might also opt for a day trip to neighbouring Victoria Falls – with its spectacular cataract, and myriad adventure activities. You may choose to relax at the swimming pool, or indulge in some treatments at the newly built Spa.